In this film information about economic development of Russia in 1913 is given. The film gives information about Russia's economic development in 1913. Museum of the History of Moscow. The exposition of the museum. Photography. Types of streets in Moscow in 1913, the people on the streets, during rest, shop windows. Museum catering. Hall of the Museum of History of Moscow - LS. Visitors to the museum are considering the exposure - MS.
Greeting card - MS., PNRM., Departure. Looks museum visitor - CU. Postcards under glass - MS. Visitor with a shopping bag in hand - MS.
Street of the old winter Moscow - LS., PNRM. Bank employees say goodbye to each other - MS., PNRM. 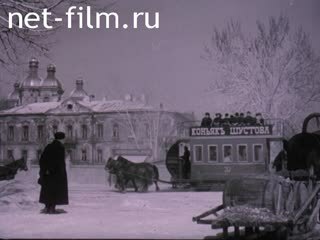 Photo: woman in a sleigh - MS.
Photo: man sits on a tram, PNRM. at the sign on the tram - MS.
Photo: people sit in the competition, out of an old family photo Christmas paper - MS.
Calendar magazine "Niva" in 1913, turning the pages - LS. House down the stairs a man and a woman with a dog - LS. Photo: A woman with a child and a man in a car - MS.; Woman on the arm of a man - MS., CU. ; Woman with a camera, a woman and a man with an umbrella on the waterfront, people at a table on vacation, people on the waterfront, ad Yalta restaurant - different. Photo: the announcement of breakfast and lunch, the people at the tables in the restaurant, restaurant menus, and the men and women in hats, a man in form - different. The bottle hit a sticker - MS.
Museum officials talk - MS.
A sign on the museum - CU. Pyramid feed cancers - MS., PNRM. Box of chocolates; visitor sniffing box - different. Photo: List of tea, people at the window of the store, enter the store "Tea» - LS., PNRM. Photo: Street of Moscow, a city with lots of festive balloons, people on the street, a young man in a hat, is a father with 3 daughters, a business card, a woman in a long dress and hat, she sits in a chair, a newspaper advertisement - Various . Photo: seamstress at a sewing machine and in his hand, money, sign the bill, taken through a magnifying glass, and the people on the station platform, fashion plate, race, children watch - different. Photo: merchants at a table with a samovar, a person merchants bank of the Volga, ships and boats by the river, the ship deck with load are longshoremen, ship deck, there are people (on deck) - MS., LS. Photo: newspaper, a man holding a newspaper and a woman standing next to, magazines, a newspaper - different., PNRM. Photo: the streets of Moscow, the inscriptions on the houses, a man with a magazine in her lap sitting in a chair, a woman sitting in a chair, the faces of people, a man at the meeting - MS., CU., LS., Departure.